All recipes are enough for four people. The printable shopping list and recipe prompts link is underneath the Smoked Haddock meal recipe. The fish cakes can be prepared in advance and stored in the refrigerator ready to be cooked. 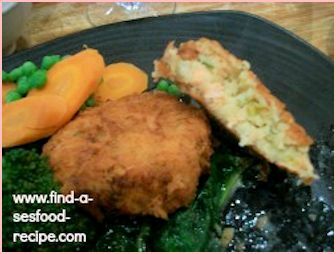 Salmon fish cakes can be made using either canned or fresh salmon. If you cooked the extra salmon I suggested last week, then you'll have some ready in the freezer. Serve with vegetables as the potato is already included. I like carrots, peas and a leafy vegetable such as spinach or kale. Some herby butter would be lovely on the veggies. This is your oily portion for the week. The fish cakes need to chill for 30 minutes at least in the refrigerator. You could make them in advance and leave them covered for several hours. It would then be a quick job to cook the veggies and fish cakes when you were ready to eat. 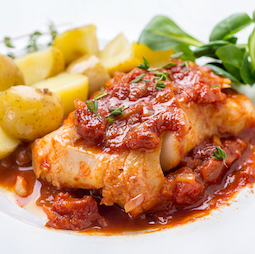 Delicious Baked Cod in a Portuguese style tomato sauce. You can use any white fish fillets - basa, haddock etc and it can be frozen or fresh. Serve with some boiled new potatoes, carrots and green beans. The sauce is really tasty and gives you enough 'moistness' without needing anything else. Smoked Haddock is one of my favourite fish. This is a super quick meal. You simply poach it in milk with a knob of butter and black pepper. Serve it with bread and butter to mop up the milk. You can add a green vegetable if you like - some cooked frozen peas would be lovely. 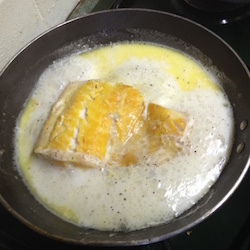 Make sure you've got it all ready before you start to cook your haddock as it will take around 6 minutes at the most. You could, if you prefer, use the milk you poach the smoked haddock in, to make a parsley sauce. You would need to top it up to a pint or so. I would then serve it with some mashed potato, peas and carrots. Download your printable shopping list here It contains the list of ingredients for all three recipes (coded) and the basic prompts, order of steps, oven temperatures and timings.